Wilms' tumor (WT) represents 6% of childhood cancers. Recent advances in molecular biology have significant implications for the clinical management. A dramatic improvement in overall cure has resulted from the adoption of multimodality treatment during the past few decades. National Wilms' Tumor Study (NWTS), and the Sociιtι Internationale d'Oncologie Pιdiatrique (SIOP) have laid down the guidelines for standardized treatment of WT, though differing in the diagnostic and therapeutic approach. Both these groups currently aim at intensifying treatment for patients with poor prognosticators while appropriating the therapy to reduce long-term complications for those with favorable prognostic features. Challenges faced in developing nations include poverty, malnutrition, ignorance, and presentation in advanced stages coupled with limited facilities that are necessary for total management of these cases. In this article, we have discussed our approach to deal with patients with nephroblastoma, reviewed the literature on the current management strategies and the long-term outcome. Most countries have adopted the NWTS protocols, while others especially in Europe, South America and some Asian countries follow the SIOP regimen. Both have their advantages and weaknesses and maynot necessarily be suitable to the setup in developing countries. We have discussed the controversial issues in the management of WT including the timing of biopsy, type of biopsy, investigative approach, role of chemotherapy / radiotherapy, management of bilateral Wilms' tumor and parenchymal sparing renal surgery. Despite deviating from NWTS at various points, the overall results have remained satisfactory. Thus, developing countries might adopt their own protocols depending on the prevalent situations and facilities available to them to treat such patients. In a child who is toilet trained the sudden onset of daytime wetting with frequency or urgency is alarming to the parents. Initially this subject was subdivided into a number of descriptive clinical conditions which led to a lot of confusion in recognition and management. Subsequently, the term elimination dysfunction was coined by Stephen Koff to emphasise the association between recurrent urinary infection, wetting, constipation and bladder overactivity. From a urodynamic point of view, in voiding dysfunction, there is either detrusor overactivity during bladder filling or dyssynergic action between the detrusor and the external sphincter during voiding. Identifying a given condition as a 'filling phase dysfunction' or 'voiding phase dysfunction' helps to provide appropriate therapy. Objective clinical criteria should be used to define voiding dysfunction. These include bladder wall thickening, large capacity bladder and infrequent voiding, bladder trabeculation and spinning top deformity of the urethra and a clinically demonstrated Vincent's curtsy. The recognition and treatment of constipation is central to the adequate treatment of voiding dysfunction. Transcutaneous electric nerve stimuation for the treatment of detrusor overactivity, biofeedback with uroflow EMG to correct dyssynergic voiding, and behavioral therapy all serve to correct voiding dysfunction in its early stages. In established neurogenic bladder disease the use of Botulinum Toxin A injections into the detrusor or the external sphincter may help in restoring continence especially in those refractory to drug therapy. However in those children in whom the upper tracts are threatened, augmentation of the bladder may still be needed. The hepatic echinococcosis in children is a serious surgical problem. The aim of this study is to investigate the participation of mast cells in liver inflammatory reactions triggered by echinococcal cysts. Liver biopsy samples were collected from the tissue surrounding the cysts from 16 sick children (11 boys and 5 girls) in the course of abdominal surgery and from 5 controls. Light and ultrastructural immunocytochemistry was performed using monoclonal antibody against tryptase. Light microscopical immunocytochemistry revealed abundance of tryptase-positive (MCT) mast cells in the capsules of the cysts (43.58 cells/mm2). There were also observed greatly increased numbers of mast cells in portal tracts surrounding the cyst, compared to those of control biopsies (26.49 vs. 1.78 cells/mm2, p=0.0009, Mann-Whitney U test). 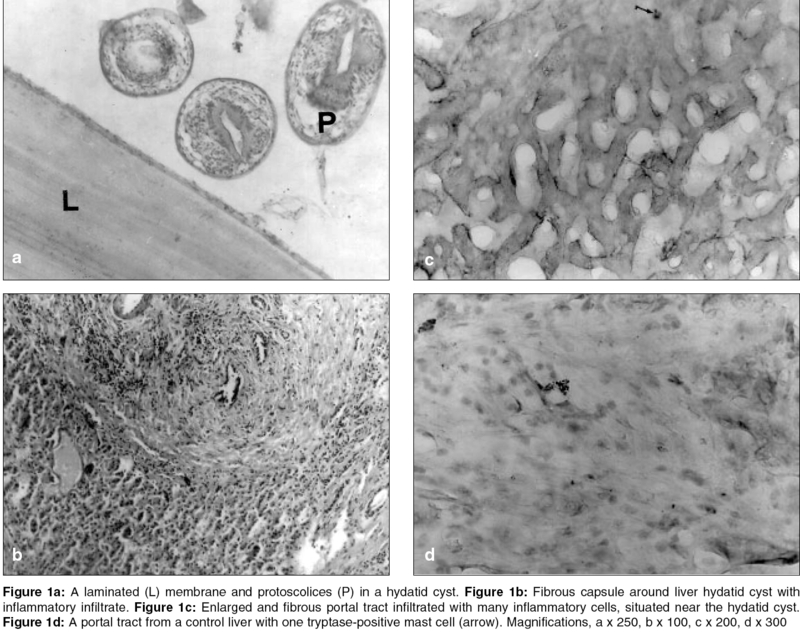 Based on the ultrastructural appearance of tryptase-positive mast cell granules, morphological sings of activation of most of the mast cells were distinguished. In conclusion, we suggest that the accumulated and activated tryptase-positive mast cells in liver tissues surrounding the echinococcal cysts play a crucial role in modulation of the inflammatory liver response and could induce chronic inflammation and fibrogenesis, resulting in serious liver injury such as nonspecific reactive hepatitis. 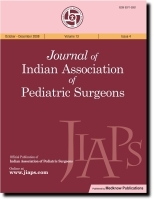 Tubularized free preputial graft for hypospadias repair had been tried in the past and discarded due to high incidence of graft shrinkage causing stricture formation. We have tried to revive the technique using onlay method thus avoiding stricture formation. The technique was used in 33 subjects (Group A) and compared with 33 subjects in control group (Group B) in whom other techniques of urethroplasty were used. The study was a randomized controlled trial. The mean length of the free preputial graft was 22.06 + 4.68 mm (16-35 mm) and breadth was 9.0 + 1.32 mm (7-11 mm). Fistulae developed in 3 patients in group A out of which one healed spontaneously. In group B, 6 patients had fistula formation. Complications developed in 18% cases in group A and 50% cases in group B. There was significant difference between the cosmetic results (p < 0.05) with 58% excellent results in group A and 27% in group B. Free preputial graft onlay urethroplasty has better functional and cosmetic results. The pathology of salmonellosis after a faeco-oral transmission was first clearly described by Jenner in 1850. Over the years, the pathological manifestations in different tissues of the body have been described. The ileum is however mostly involved leading to enlarged Peyer's patches, ulceration, and sometimes bleeding and perforation. Efforts at control have largely been improvement in public water supply, safe disposal of waste, and general public health measures. Despite these measures, intestinal perforation from salmonellosis remains the commonest cause of emergency operation in children above 3 years. The incidence continues to rise, so also the mortality, despite new antibiotics and improvement in facilities in the hospitals. Even more disturbing is that we now see more perforations per patient, and more involvement of the colon. 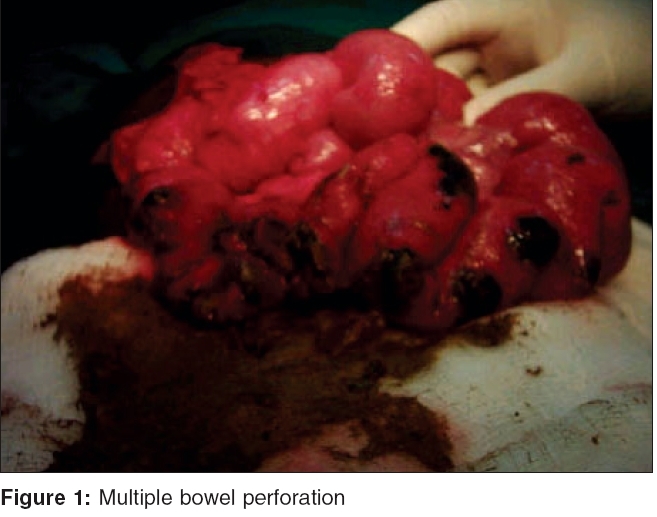 Three recently managed patients with multiple ileal/colonic perforations were reviewed. Presenting problems, delay in referral, choice of antibiotics and postoperative complications were noted. One patient had 27 perforations and another 14 perforations. Both survived. Is salmonella changing? Are our patients changing? Is the environment changing? Are the goal posts changing? This article details our recent experience with this dreadful disease, reviews the new literature and makes suggestions for the way forwards. A rare case of traumatic perforation of the ileum in a neonate due to mauling by wild monkey from a hilly area is reported. The patient presented with features of septicemia, bilious vomiting, abdominal distention and signs of peritonitis. 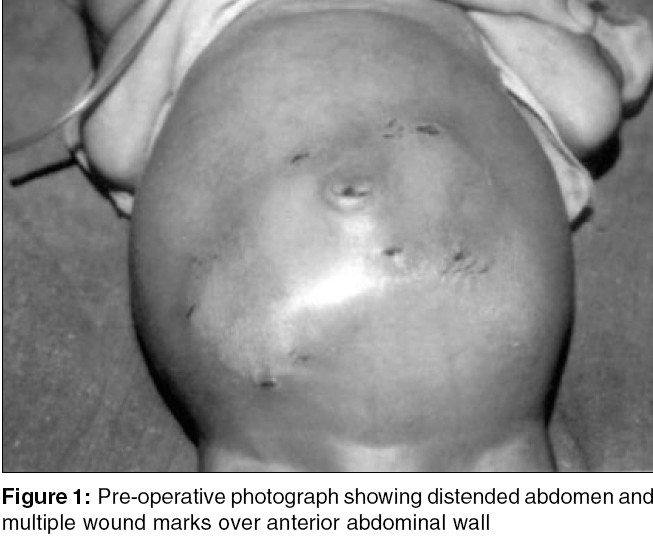 Exploratory laparotomy with closure of the perforation was performed and the baby survived. After thorough and careful review of available English literature, we found no similar case and this forms the basis of present publication. 7 months old male child presented with abdominal distension since birth. On examination there was a lobulated, tense cystic mass occupying almost 2/3 of the abdominal cavity. 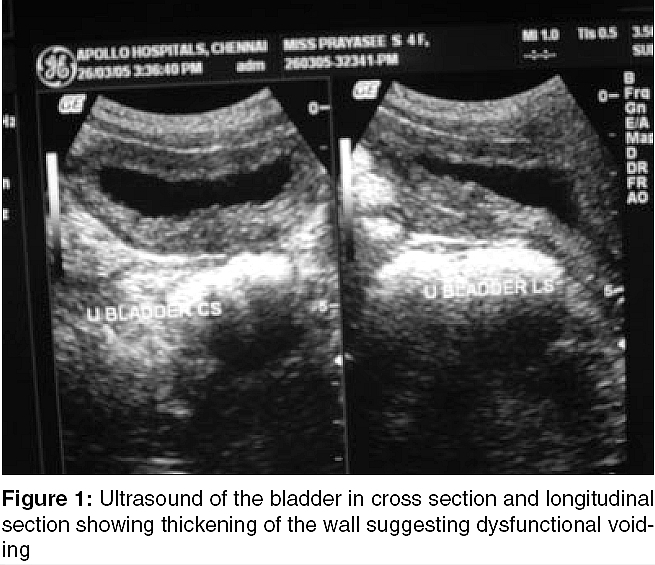 Ultrasonography (USG) revealed a predominantly hypoechoic mass measuring 17cm x 14cm x15cm. 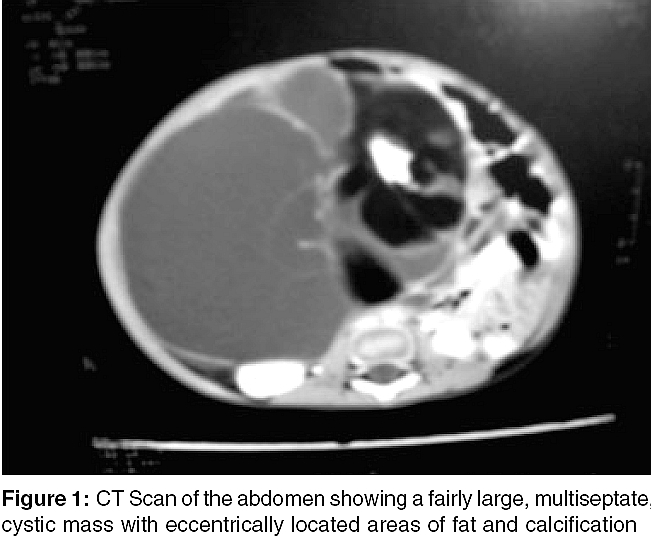 CT scan of abdomen showed a multiseptate cystic mass with eccentrically located areas of fat and calcification. Exploration of the abdomen revealed a huge thick walled cyst within the leaves of the mid ileal mesentery which could be enucleated out entirely after careful dissection. Histopathology suggested it to be a benign cystic teratoma (Dermoid cyst). Penile agenesis is an extremely rare disorder with profound urological and psychological consequences. The goal of treatment is an early female gender assignment and feminizing reconstruction of the perineum.